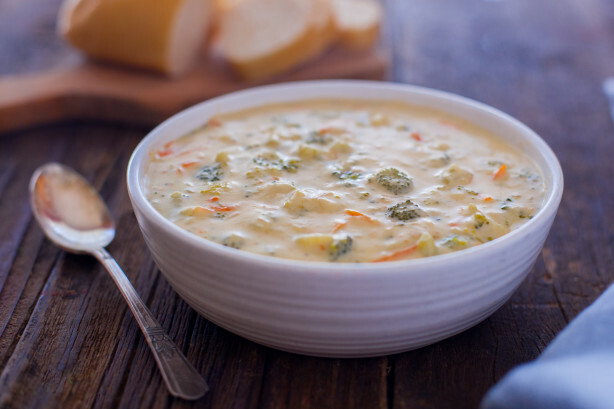 The ultimate comfort food - fresh broccoli, carrots, and cheddar cheese. Serve with Asiago rolls or crusty bread. Dovetailing tip: Don't forget that you prepared the broccoli for today's soup. Isn't it nice to have part of the meal prepared? Cook melted butter and flour using a whisk over medium heat for 3-5 minutes. Stir constantly and add the half & half. Add the chicken stock. Simmer for 20 minutes. Add the broccoli, carrots and onions. Cook over low heat 20-25 minutes. Add salt and pepper. Can be puréed in a blender if you like a smooth consistency. I prefer to leave it chunky. Return to heat and add cheese. Stir in nutmeg. Serve with crusty bread and Enjoy :).